I was browsing the interweb and came across an interesting video. Check it out. If you do not get it, the guys are actually sticking the windows logo onto an Apple Store in Hamburg, Germany. I found that quite amusing. The prank was done by Microsoft fanboys. Wouldnt it be funny if Windows users were bought to the apple store and actually bought Apple products? I was multi tasking between surfing, reading reviews on the new camera’s being announced at dpreview.com, selecting_ resizing and uploading photos to facebook and waiting for the download of Star Wars: The Clone Wars, Episode 15: Tresspass to finish download. When I stumble to engadget. Windows 7 SKUs announced. Hmm.. the industry have been saying that its almost ready and the alpha version is as good as the release version. In any case it was still predicted to go thru a beta phase for at least 6 months or more. Heck, I had high hopes for it. Been following Rafeal Rivera’s blog on it. So its now announced that there will be 6 versions of Windows 7. SIX! ENAM! *replace with your own language / dialag*dialect (thx matt for the correction)! How can it be 6 flavours of one operating system ? 3 applications!? So you run a web browsers, an IM and music player, and thats it. You cannot run any more applications. Then again its probably bundled software. Hmm… Looks like Microsoft is putting up a fight against free OS (open sourced). At US$ 260.00 it will be (about) RM 939.38 for Windows 7 Home Premium. If not mistaken the current Windows Vista is about the same price, or slightly cheaper. I had high hopes for the new Windows OS. I was planning to build a new rig to play Diablo III. Now.. I guess I’ll have to wait and see. WOW! Where did the time fly to ? Well my pc have been suffering for the past few weeks. 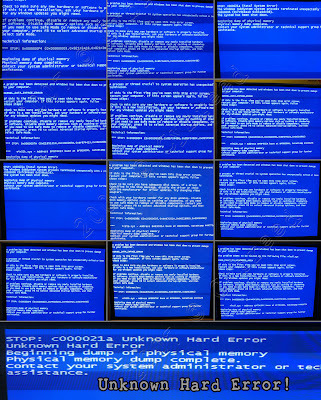 Having BSODs (BLUE SCREEN OF DEATHS). Click image to see more details! Right my poor poor PC. I was quite annoyed till I didn't really read the error codes. Namely the 0x0000007A, 0x00000050, 0x000000F4, 0x0000008E, and c000021a. So after much scouring the interweb. I still couldn't find a solution for my PC. I did a bunch of test, memory test, processor tests. All passed with flying colours. The PC would boot up for about 4-5 mins then BSOD. Arght! Then it would work okay for about 20 hours. Then for no reason what so ever, BSOD!!! • Mismatched system files have been installed. • A Service Pack installation has failed. 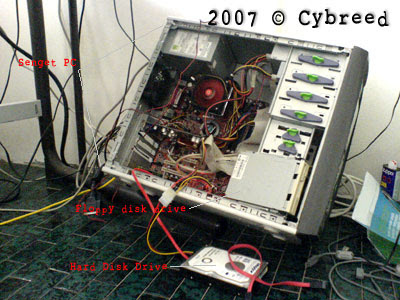 • A backup program that as used to restore a hard disk did not correctly restore files that may have been in use. • An incompatible third party program been installed. • The paging file contained a bad block. • If the page file is on a SCSI device, the trap could have been caused by improper termination. • Bad cabling from hard disk to controller. • An error on the disk controller. • Running out of non-paged pool resources on the server. Its now 2AM. And I'm done! Thinking about my crappy PC makes me not happy! And when I'm not happy I wanna sleep it off, or I'll start smashing things to bits. *and as I have said in my previous post, Happy FRiGGIN new year!!!! !